Shared service’s center is where business operations are consolidated in a centralised way within an organization or group. The similar capabilities are wrapped in specific kind services with well-defined process, procedure and service contracts which are to be used by teams. During Business Transformation Shared service centres come to light. Benefits of shared service centers are numerous as its cost-effective operational strategy designed in a way by eliminating repetition of effort. By providing centralised service, opportunity to optimize and standardise it at scale is there. Human resources are best utilised under the concept of shared service and due to Outsourcing Shared Services manager jobs have picked up pace in market. Based on Industrial analysis in the on-premise model, an organization plans for the peak capacity of use of resources and buys hardware accordingly (Cap-Ex). However peak performance might happen only 10% at the time or even less. Thus, these resources are underutilised and as the organization has already bought everything so nothing much can be done. Therefore, its efficient to go for human resource outsourcing and shared services outsourcing. Operational capabilities such as an IT department or other internal departments. Allowing business units to go outside of IT and deal with technology vendors directly has a variety of risks as business units may not have the capabilities to manage things like architecture, compliance, data and information security. Shared services management comes under Business Strategy and Operational Strategy. It cost effective by reducing duplication of effort, achieving economies of scale, Improving quality of services with standard methodologies and service level objectives. SSC drastically reduces personnel salary cost and other costs up-to 20% in 0-2 years. We pioneer our self with unique form of shared services company in India specially focused on back-end IT needs. Our SSC works on Hybrid tech support model where it brings in regular features of managed services and issue-based technical support. In this scenario the issues/tasks are being reported to our sson Shared Service Center and our dedicated consultants in work on resolutions round the clock. The billing is based on initial cost and task/issue bases. Thus, our prime focus becomes to get the work done with right quality. 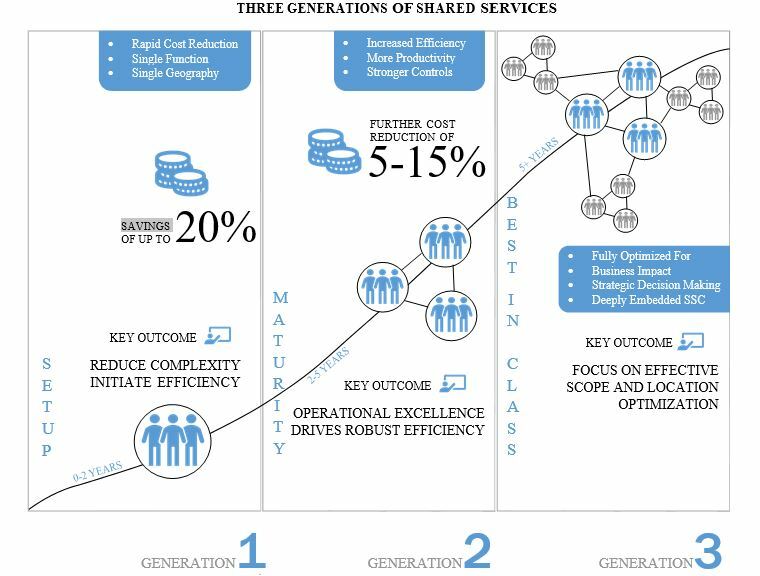 There is one very important characteristic that dictates the PAYSE model for Shared Services is that of elasticity and efficient use of resources. In the Cloud PAYSE model works well most of time as you are working under a normal load and paying accordingly. So for any spike in the demand, resources can be added elastically and you pay for what you use. Same resources that gets utilised during the peak time could be re-purposed for other organizations during average load.